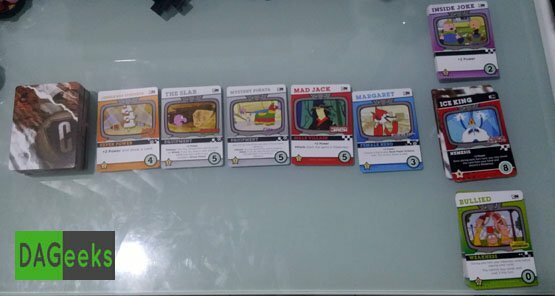 Cryptozoic‘s latest deck builder based on the world of Cartoon Network. It uses the same Cerberus engine that Cryptozoic has been using for their other deck-building games, with some notable differences. What makes this Version of their deckbuilders unique is their focus on player interactions, from fist bumps to, attacks that require players to stand or eat. in the Cerberus engine. normally vulnerabilities have no ability or VP. while in CN:CC their vulnerability equivalent the Pratfall has the ability to move a weakness from your discard to the bottom of the weakness stack. 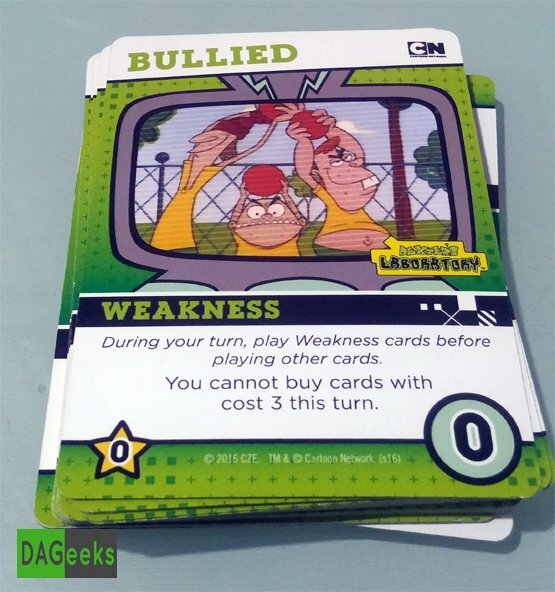 compared to DC comics and the other deckbuilders the weaknesses had no effect and all they did was give a negative point for after the game ends, basically just a filler card, while the CN:CC version has different abilities for each card(all weaknesses must be played first), but with no negative VP value. the usual stack of cards next to the nemesis/super villain in the Cerberus engine was a super power card called kicks that give +2 power at cost of 3. 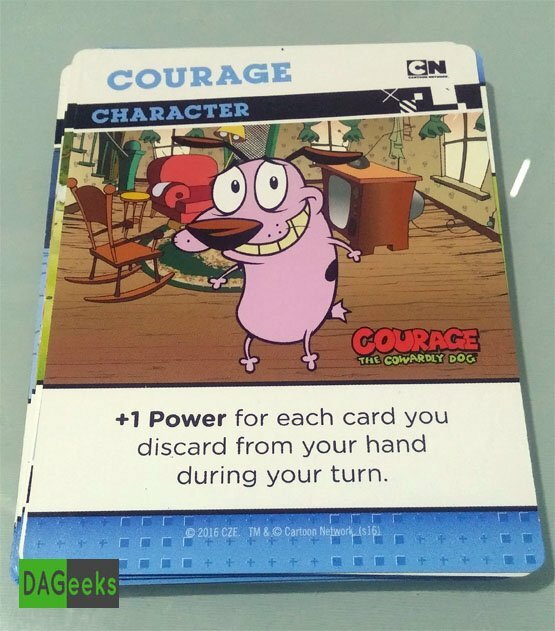 In CN:CC there are no more kicks, just inside jokes, a card with no type that gives the same +2 power at a cost of 2. Rock, Paper, Scissors – play a game of rock paper scissors, winner gains a benefit. I’ve already played the game twice, once with my cousins, who are not so familiar with deck builders, and some friends who were a little more experienced. In my game with my cousins i felt it was really easy to teach the game, not only because of the simple mechanics of the game but also because of the theme that was used. From my eldest cousin, who picked Dexter, to my youngest who picked the Waterson family. We all had something we recognized. On the second playthrough with the more experienced group, again there were some cartoons we didn’t recognize, that didn’t take away from the fun we had though. The game even with all of the wacky events like singing your sentences, acting like animals, or even making annoying sounds, still doesn’t fail to have the competitive feel to it. One of the things we enjoyed about the game was how much interaction there was with each other. some would play cards that would force the others to stand or risk getting a weakness, other cards make you play a game of rock paper scissors. The last part i liked with this game was the changes they made to weakness and vulnerability, starting with the Pratfall cards didn’t have any immediate benefit until later in the game, and with the weakness cards now have different abilities instead of just the point deduction at the end of the game. I feel because of these changes to the cards it has added more depth to the game because of the decisions needed to be made, ‘Should I destroy this card or that one?, but what if I get a weakness later on’. I would have to say among all the Deck-building games Cryptozoic has made, this has to be their best one yet. with the activeness of the weakness cards in messing with players hands and turns to the wackiness of the abilities. 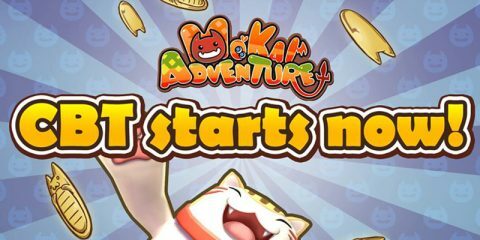 The game is well themed and provides a lot of player interactions, making it more of playing against the players than against the decks. The change in the readily available Inside Joke Cards ensuring players can buy something even if they drew all 3 Pratfall cards. 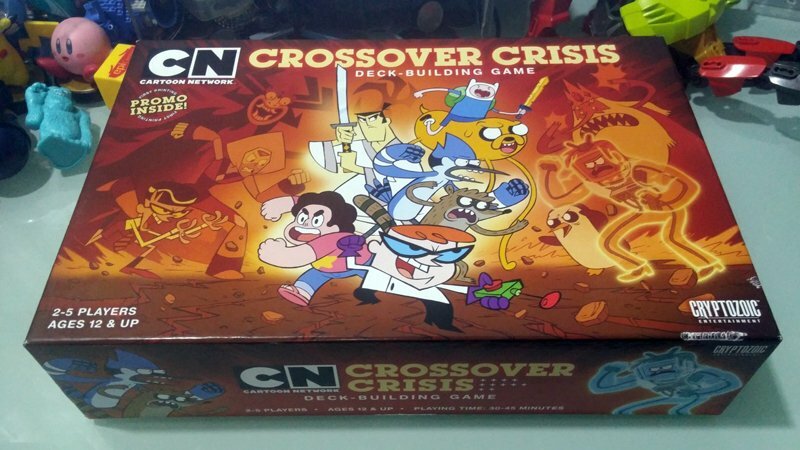 The thematic nature of the game that covers basically tons of Cartoon Network cartoons ranging from theDexter’s Lab all the way up to ongoing Steven Universe provides something for every Cartoon Network fan. I have one minor nitpick, it being about the card called Ringo, requiring players to have some snacks nearby when playing, again easily fixed by taking it out of the game if you don’t have any snacks handy, but that is one negative against all the other positive things I’ve mentioned. I highly recommend getting this game for both families and friends.